This project comprised 35 flats for rent (3 Accessible Flats and 31 Elderly Amenity Flats) and a common room with adjoining landscaped amenity roof garden. 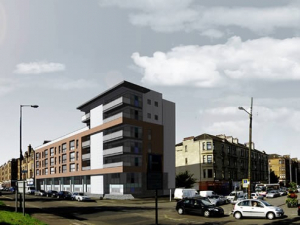 The 7 storey residential development for Govanhill Housing Association is located in the North East corner of Govanhill at the junction of Cathcart Road and Butterbiggins Road. The properties are served by 2 communal lifts, and have a communal refuse system (including recycling). The development achieved an Ecohomes Very Good rating. All flats benefit from video door entry systems. Heat recovery ventilation systems are specified for all flats, in conjunction with condensing gas boilers. High levels of insulation, triple glazing, and good air tightness are specified to ensure that energy use is minimised.